Please ensure you read Payment Methods, Registration terms & Cancellation Policy before you register. All payments must be made in USD or EUR. You can pay registration fees by credit card, wire transfer or PayPal online payment system through the website. - For Early Bird rate, payment must complete before 23:30(GMT+2), April 10 2014. - For standard rate, payment must complete before 23:30(GMT+2), May 8, 2014. Or registration will be considered as late registration. - Discount codes can be requested for group registrations or sponsors. 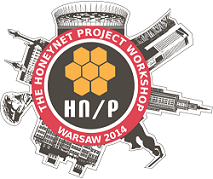 The Honeynet Project reserves the right to cancel any registration using unauthorized discount codes. - Accommodation costs are not included in the registration fee. - Payment of on-site registration must be made in cash. - A US$20 wire transfer fee will be added to your invoice for each invoice/wire transfer. - Proof of payment for wire transfers can be accepted no later than April 30th. - Workshop registration cancelled 30 days or more before the first workshop day will be free of charge; registrations cancelled within 30 days of the first day will incur a cancellation fee of $60USD. No cancellations will be permitted after the workshop begins. - No refunds for wire transfer payment at any time. Substitutions are allowed. - Substitutions may be made at any time. Please contact [email protected]if you need to substitute a registrant.